HMS Belfast was launched on St Patrick's Day, 17 March 1938 by Anne Chamberlain – the wife of then Prime Minister Neville Chamberlain – and spent 25 years in active service before she was brought to London by IWM and opened to the public on Trafalgar Day, 21 October 1971. IWM had been investigating the possibility of preserving a Second World War cruiser from as early as 1967, which led to the formation of a trust headed up by one of HMS Belfast’s former captains, Rear-Admiral Sir Morgan Morgan-Giles. 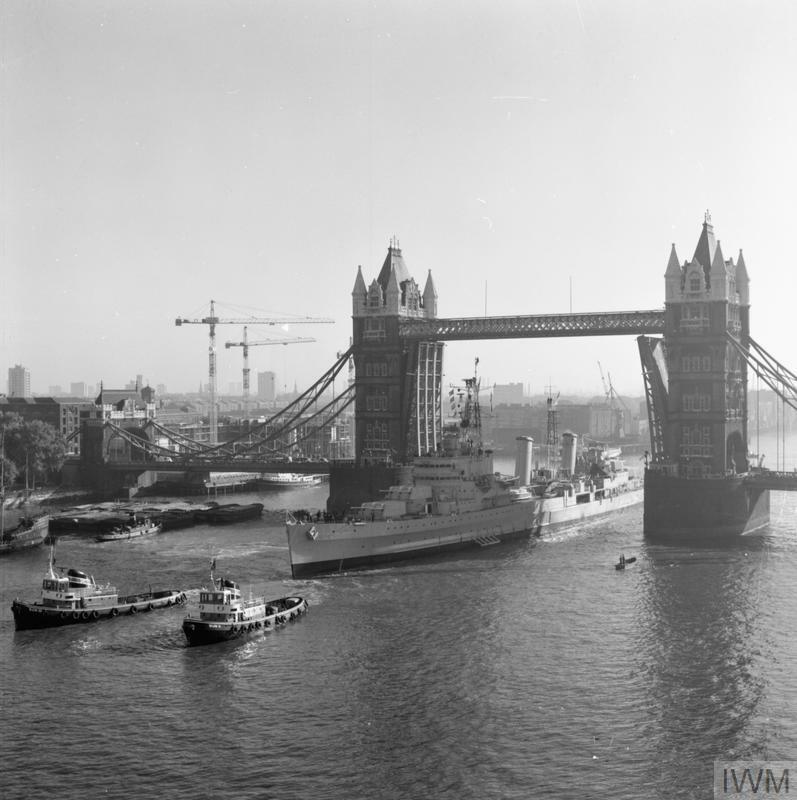 This trust eventually succeeded in salvaging HMS Belfast from the scrapyard, safeguarding her for future generations, and today HMS Belfast is the last remaining vessel of her type. Built by Harland & Wolff in 1936, HMS Belfast was commissioned into the Royal Navy on 5 August 1939 after fitting out and builder's trial. In 24 years of active service she would go on to play key roles in battles and peace-keeping duties around the world. Designed for offensive manoeuvres as well as the protection of trade, HMS Belfastwas immediately called into service to help impose a maritime blockade on Germany. After only two months at sea she was hit by a magnetic mine whilst on patrol. Though there were few casualties, the damage to her hull was so severe that HMS Belfastwould not return to active service for another three years. When she re-joined the fleet in 1942, HMS Belfast was still the largest and most powerful cruiser in the Royal Navy. More importantly, she was also equipped with the most advanced radar systems. This allowed HMS Belfast to play a crucial role in protecting arctic convoys the Allies sent to Russia, which would became their main supply route once they entered the Second World War. HMS Belfast was also involved in the Battle of North Cape, notable for the sinking of German battle cruiser Scharnhorst and the loss of all but 36 of her 1,963 crew. HMS Belfast continued to protect arctic convoys to Russia until 1944, when she was called upon to support the D-Day landings and even fired one of the first shots on 6 June 1944. HMS Belfast spent five weeks helping to land more than 132,000 ground troops on the beaches of Normandy as part of Operation 'Neptune', the seaborne invasion of northern France. Allied navies bombarded German coastal defences before and during the landings and continued to provide artillery support after D-Day as troops moved further inland as nearly 7,000 vessels took part in the invasion. After the Second World War, HMS Belfast played an active role in the Korean War working with Allied Forces to support the retreating American and South Korean troops from 1950-1952. Her final years were spent performing peace-keeping duties until HMS Belfast was retired from service in 1963.